St Astier Stone repair mortar is a specially formulated mortar based on St Astier Natural Hydraulic Lime and aggregates for the repair or simulation of masonry, brick or stone. 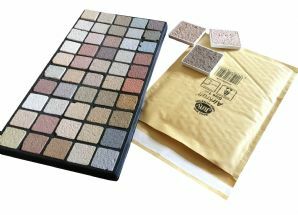 Our colour matching service provides an accurate match for your existing stone. Simply send us in a sample of the stone and our expert team will find the best possible match. We will then post 3 Stone repair mortar briquettes which are our best match to your existing stone - each with a separate colour code. - Return pre-paid postage label to post the sample back to us. (can be posted in via a Post Office or postbox). - Within 5 working days 3 matched samples will be returned to you for you to compare and decide which one you preffer. Please note all samples sent to us must not exceed 2.5cm x 2.5cm x 2.5cm or weigh more than 100g.